Due to multitude of factors, even the most experience off-road drivers can end up being stuck in the middle of nowhere. Vehicles can easily end up in a ditch, get stuck in snow or mud. The list of scenarios in which overlanders get stuck is endless. However, that wouldn’t be a problem if there was a towing company nearby. If you drive with another overlander, you can help each other out just with a tow strap. But what if you get stuck with your rig in the middle of nowhere, miles away from another vehicle? Getting your own winch will ensure that no matter where your rig ends up, you’ll probably be able to free it without too much hassle. 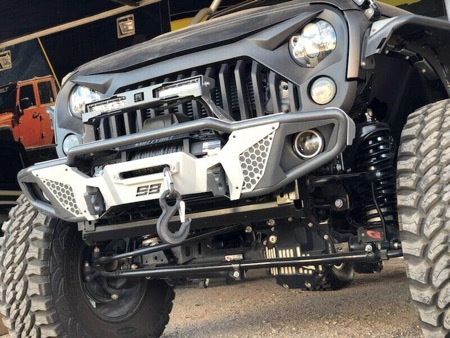 We’ve prepared two Smittybilt Winch reviews for you (reviewing the XRC and the X2O winch ranges) so that you can decide if these products meet your requirements. The X2O Waterproof Winch range from Smittybilt has a few features that put it apart from other series marked by the brand. Each model has been enhanced in such a manner to increase the performance and provide a hassle-free operation. Every winch from the X2O range features a Series Wound 6.6 HP motor that has been completely sealed off from external factors, ensuring maximum protection. The motor is also fairly quiet, offering superior comfort as you are operating the units. Furthermore, depending on the model from the range, you may choose smaller to bigger capacities. You can go from 10,000 to 17,500 lbs., based on the load that you need to pull and lift. If you have a bigger vehicle, it’s obvious that you may want to go for something such as the 15,500 lbs model, with its load capacity and the steel wire rope. This range also includes a 3-Stage Planetary Gear System as well as a fully waterproof solenoid pack of 500 AMP power. You can mount it in two different locations, without wasting any effort on cables. Everything can be unplugged, acting with a wireless operation. This line also features optimized ratios of the gear to ensure a top speed of the line. For ultra-high performance, you may also want to go for the X2O COMP models. They all have the same features of the original X2O series, with the addition of a lighter synthetic rope. However, the original models were made with a steel wire rope that is also very durable. Additionally, the GEN 2 X2O models feature a Dynamic Braking System as well as an aluminum fairlead. The breaking system will help reduce the temperature of the drum by as much as 66%, ensuring a lifelong functioning of the models. Every winch also features a remote control that allows you to operate the device from a safe distance. This is a very important feature, in our opinion, but it comes with its drawbacks as you will read it later. 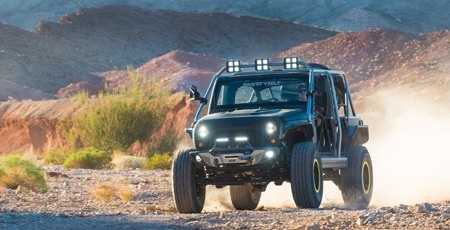 The Smittybilt range also features a mechanical lifetime warranty, offering peace of mind to users in the event that any of the devices malfunctions. Considering all of these features, you may expect that the Smittybilt will be a very useful tool regardless of the circumstance. The Smittybilt XRC winches have also undergone a series of developments to make them more performant. This range can be found as a result of two generations – still, Gen 2 is the one that most people seem to prefer. Like the X2O, this range is also waterproof enough to resist being stuck even in a downpour. The general waterproof rating is IP67, which means that it’s completely sealed off from water damage, but not as isolated as the X2O winches. The motor is also the classic 6.6 HP Series Wound, popular for its quiet operation and the fact that it can handle rather heavy loads. For this reason, this winch is very popular when it comes to pulling 4x4 or off-road vehicles. Every Smittybilt winch uses a high-quality aluminum fairlead. Depending on the model, you can choose a winch between 9,500 to 17,500 lbs load capacity. Similar to the X2O, this range also features a 3-stage planetary gear system. Its revised gear ratio will permit a much stronger pulling power as well as a faster line speed, allowing you to release your vehicles from “slippery” situations. The solenoid box may also be mounted in three locations. The entire assembly measures around 46 lbs., making it quite easy for the rig to carry it around. Most winches also come with a remote, but not all of them. For example, this 9,500 lbs capacity model does feature a remote control – but it is not wireless. Depending on the state of the rod, you may have to get your hands (and clothes) rather dirty. Featuring a sliding ring gear clutch and a 2.5” drum, you could say that it is, once again, similar to the X2O. The rope size can also be chosen depending on the size of the vehicle – but the difference remains in the material. The fully synthetic ropes used are military grade. An excellent choice for most vehicles! The Smittybilt XRC range also includes a lifetime warranty – so, in the event that the unit breaks down on you, you can rest assured the manufacturer will help you. However, you should know that it is durable. So, chances are that you won't even need the warranty. Overall, if you choose a winch from this range, it is a good option to take with you on an overlanding adventure. ​​​​​Please note these ratings are for fresh water though. So be careful when you're stuck on a beach. The X2O winches are equipped with wireless remotes, whereas the XRC Smittybilt winches come with corded ones. Now that can be very convenient and safe, but what about dead batteries in the remote? That's when you'd want a corded remote! The Smittybilt XRC and X2O winches are roughly in the same price range, with the XRC being slightly more expensive on average. In terms of warranty, the X2O winches win again, as they come with a lifetime mechanical warranty and a 5 year electrical warranty. The XRC winches also covered by a lifetime mechanical warranty but only with a 3 year electrical warranty. This is probably due to their lower waterproofing rating. Choose the X2O or the XRC? For folks who use their winch more often and for deliberate off-roading, we'd recommend the X2O range with the appropriate load capacity. If you want to install a winch for your overland rig as an insurance policy, so you don't expect it to use it that often, then choose a winch from the XRC range with their corded remote. If you don't end up using your winch too often, make sure to check it from time to time. A winch needs to work when you're in a hopeless situation! Look after it and it will help you in those few but difficult situations in the wilderness. If you're still unsure, read our comprehensive guide on how to choose the best winch for your vehicle here.